Here is a photo I cannot resist posting. 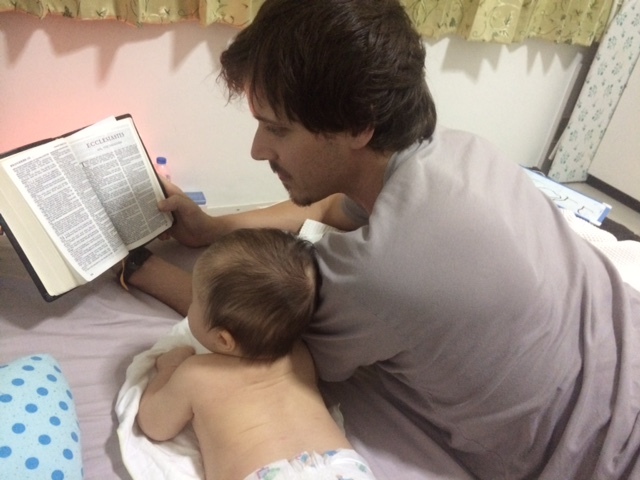 It is my nephew reading the Bible to his three-and-a-half-month-old son. Just as the son of God learned everything from His Father, this little one is off to a good start learning from his daddy. It is among the top most precious photos to come my way recently. On this Good Friday, let’s remember the teachings of our Father and His Son as well as what a picture like this can teach us. This entry was tagged Bible, fathers and sons, Good Friday, learning, life, love, precious moments. Bookmark the permalink. I feel your pride and joy. Priceless. They are my sister’s pride and joy, and you’re right, the photo is priceless. Thanks for your input, Murland.